Altering the tax status of retirement savings contributions will undermine the workplace savings system. Without incentives, few Americans save for retirement on their own. Congress should not view retirement savings tax advantages as tax expenditures. Now that tax reform is moving to center stage in Congress, lawmakers face a balancing act: how to respond to calls for reducing taxes without causing an already unwieldly deficit to skyrocket. In its recent tax reform proposal, the Trump administration called for significant tax-rate reductions for individuals and corporations, as well as the elimination of specific taxes such as the estate tax and the alternative minimum tax. Congress will undoubtedly look for ways to reconcile tax reform with the existing budget and its current system of collecting taxes, fees, and revenues. That’s the point at which retirement assets, or more specifically, the tax status of retirement savings contributions, may be at risk. Retirement savings incentives were already under scrutiny after placing among the top 10 federal tax “expenditures” calculated by the Joint Committee on Taxation in its analysis earlier this year. 1. Retirement savings tax advantages are not true tax expenditures. Contributions to qualified defined contribution retirement savings plans like a 401(k) are tax-deferred. The funds are taxed as ordinary income when withdrawn in retirement. 2. Altering the tax status of retirement savings contributions will undermine a system that millions of Americans rely on for retirement security. The fact is that most people do not save for retirement unless they have incentives. Workers with access to a workplace pre tax savings plan are 10 times more likely to save than workers without a plan. According to the Employee Benefit Research Institute (EBRI) 2017 Retirement Confidence Survey, 74% of those with a workplace plan are currently saving for retirement, compared with 7% without a plan. 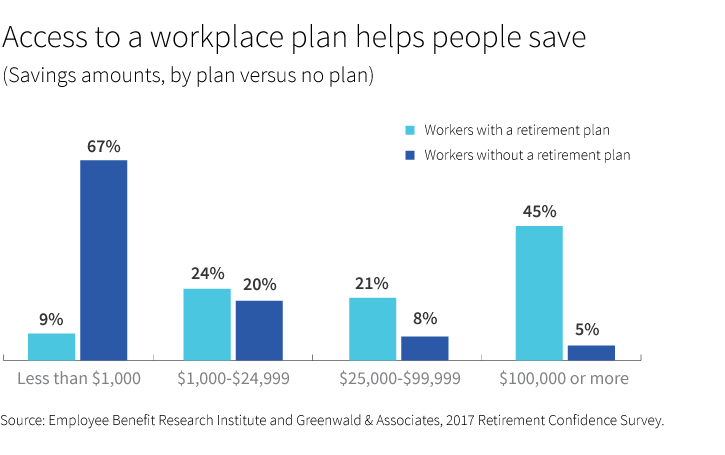 Workers participating in an employer-sponsored retirement savings plan have more in savings than those without a plan, EBRI found. About two-thirds — 67% — of workers without a retirement plan report having less than $1,000 in savings and investments. Among workers with a retirement plan, that total is just 9%. Proposals to eliminate the tax-deferred status of 401(k) contributions or to reduce contribution limits are short-sighted. The fallout would undermine decades of progress made in helping people save for retirement and deplete an important source of capital in our financial system, which could slow economic growth. It would also raise the poverty rate among seniors. At its basic level, the proposal flies in the face of our shared value that all workers should have the ability to retire with dignity. There is significant research that illustrates that having access to a retirement savings plan in the workplace makes a difference in retirement preparedness. Today there are some 42 million Americans who do not have access to a workplace plan such as a 401(k). Expanding access to retirement savings plans for all workers should be a policy priority. Diminishing or eliminating a proven incentive to saving would undermine the 401(k)’s historical success and cripple its potential.